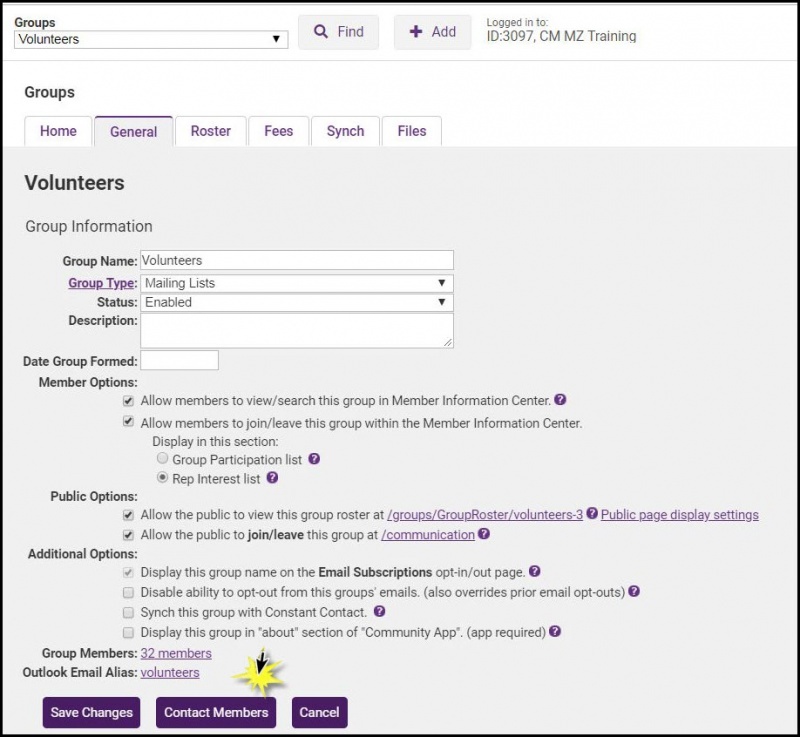 Sending communication via email and letters may be simplified by creating self-defined groups in the Groups module. For instance, if you frequently send emails to your Budget Committee, instead of selecting the 12 members of that committee each time you send an email, you first create a group in the Groups module called the Budget Committee. Add each of the 12 members to that group. Then when you go to send the email, you simply select the Budget committee as the recipient of the email with one simple click. Click Here to view an overview of Communications & Groups. Click Groups in the left-hand menu. Click Create a Group on the Home tab. Group Name: Enter a name for the new group. Group Type: Select a group type from the drop-down list. Status: Select Enabled from the drop down list. Description Enter an optional description of the new group. Click the Group Name of the new group on the Home tab. Allow members to view/search this group in Member Information Center - When selected, this roster list will be shown as a group/interest that may be searched by members in the Member Information Center. Allow members to join/leave this group within the Member Information Center. - When selected, members will have opportunity to join/leave this group/interest on their own in the Member Information Center. The selection of Group Participant list or Rep Interest list determines where the selection will take place – under Groups or under Interests. Interests. Allow the public to view this group roster at /groups/GroupRoster/young-professionals-4 - When selected, this group will display on your website in the Groups public module. Click Public Display Settings to modify how the group is displayed. Allow the public to join/leave this group at /communication - When selected, this group will appear on your public website at the suggested URL where the public may add themselves to the group. This is often used for consumers to subscribe to (join) your mailing lists. Display this group name on the Email Subscriptions opt-in/out page - This selection will ensure that the name of the group is displayed on the resulting opt-in/out page that uniquely displays for a recipient of an email when they click the Unsubscribe link in the bottom of their email. Disable ability to opt-out from this groups' emails. (also overrides prior email opt-outs) - When selected, this group cannot be unsubscribed from. Select this checkbox to make sure your board members or other committee members don't accidentally unsubscribe themselves from your group. Use only on rare occasions when you know your subscribers have agreed to this email relationship with you. Synch this group with Constant Contact: Enable this option, if you wish to sync additions, edits and deletions from this group to Constant Contact. Display this group in "about" section of "Community App". (app required) - When selected, this group will be accessible through the community app (when purchased). Members may choose to join or remove themselves from groups if Allow members to join/leave this group within the Member Information Center is enabled for the group. When a member logs into the Member Information Center, they are able to select the desired groups, under My Info > Groups/Interests. Click Create a Group (See Create A Group) on the Home tab OR click the hyper-link for an existing group. Click the Groups Participation list radio button. Perform any additional configuration as desired. The group will now display in the Member Information Center, under My Info > Groups/Interests in the Groups section. When members joins the groups via the MIC, they will show on your Roster tab. Reps may opt-in to an Interest Group that has been created and designated by you. 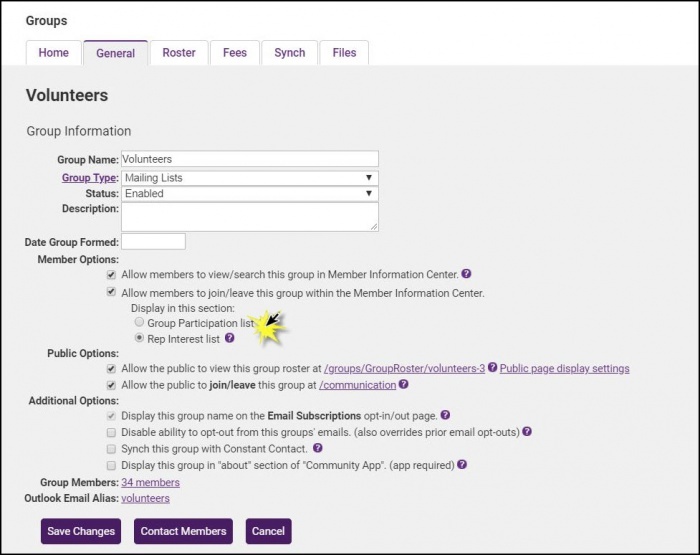 Simply create the group, mark it as a rep interest group that can be selected by members, and then members will see this as an option to select when logged into the Member Information Center. Click the Allow members to select this group within the Member Information Center check-box. Click the Rep interest list radio button. The group will now display in the Member Information Center, under My Info > Groups/Interests in the Interests section. When members join the groups via the MIC, they will show on your Roster tab. You can design your groups to allow the public (consumers, non-members) and members to easily sign up for groups and mailing lists. Your software provides a public module, like the business directory, event calendar, etc. Visitors will fill out the contact info and select desired group(s). After replying to a simple confirmation email, the visitor will be added to your group. By enabling Allow the public to join/leave this group at /communication within your group configuration, you can then integrate the provided link into your web-site. Visitors will fill out the contact info and select desired group(s). After replying to a simple confirmation email, the visitor will be added to your group. If the email used on the form matches an existing representative then the group membership is tied to a particular representative, and thus a membership. If the email doesn’t belong to a rep then it is created as a Community Member. Recipients may unsubscribe via the unsubscribe link in the emails or submit another form with no groups selected. Both the Custom Representative and Custom Member reports can easily be used to create groups. For example, if you would like to create a group of all representatives who do not have login credentials, so that you can send them the log-in instructions email, this can be done using the Custom Representative report. See Member Reports for instructions. Select the group's Roster tab. Add representatives by type/status: Select this options to add members to the group based on their membership type and/or membership status. Add representatives by member: Select this option to display a list of members, from which you may select the members to add to the group. All reps of the member will be added to the group. If you wish to select specific reps, use the Add specific reps by member name option described below. Add representatives by category: Select this option to display a list of all directory categories. The representatives associated with the member that is assigned the category will be added to the group. Add representatives from other groups: Select this option to display a list of all groups. Select the group(s) from which you would like to add representatives. NOTE: All representatives from the group will be added. Add individual representatives: Select this option to display a list of all representatives, you may then choose the individual representatives that you want to add to the group. Add specific reps by member name: Select this option to display a list of all members. Once a member is selected, you may choose the specific reps of the member to add to the group. For this example, select Add specific reps by member name. Choose the member whose reps you wish to add from the list, or search for a member by typing the name in the Member Name text box. To view all members, clear the Show active & courtesy members only. check-box. Double-click the desired member. All representatives of that member will be displayed as selected in the Select Reps: window. De-select the check-box(es) for the reps you do not wish to add to the group. NOTE: Reps may also be added to Groups on the the Reps tab, in the Group Participation section. See Manage Rep Group Participation for further instruction. Click Add/Edit Roster Custom Fields. Field Name: Enter a name for the custom field. This is the name that will be displayed in the back-office. Display Name: If this field is displayed publicly, enter the name to be displayed. If blank, the field name defined above will be used. Click the Data Type arrow, and select the desired data type. If the selected data type is Text enter Text Size. If the selected data type is Drop Down List, enter the desired list of items. Visible to Public: Enable this check-box if this custom field should be displayed publicly. Required: Enable this option if this custom field is required. Click the name of the rep for whom you wish to update the custom field. Enter the desired custom fields. NOTE: Custom fields are not displayed on the group roster tab. To view the list with custom fields, click the Download List button. Disabling rep(s)in a group will de-activate the rep, which will keep the on the group's roster, but prevent emails from being sent to them. On the group's Roster tab, click the check-box in the last column for the rep(s) you wish to disable. Click the Disable Selected Contacts button. NOTE: You can also disable a representative in a group from the member's Reps tab. You can remove a representative from a group from the group's Roster tab. On the group's Roster tab, click the check-box in the last column for the rep(s) you wish to remove. Click the Remove Selected Contacts button. NOTE: You can also remove a representative from a group from the member's Reps tab. At times, you may have fees associated with fee items, such as a participation fee. Fees may be added to the group, then managed through batch processing. NOTE: Finance or Administrator permission level is required to add fee items to groups. On the Home tab, click the link for the desired group. Click Assign Fee Items. NOTE: If you have not previously created the needed group fee item, you may click on Define Fee Items. Click Here for instruction on setting up fee items. Select the Fee Item Type from the drop-down list. If needed, edit the Fee Amount. If needed, edit the Billing Cycle. The Billing Cycle tells the software how frequently the fee item should be billed. For example, if you want to bill the annual fee monthly, select Monthly. Click Groups in the left-hand navigation panel. On the group General tab, click Contact Members. Select Contact with ChamberMaster or Email with Outlook. See Send a Mass Email for further instruction on sending the email. There is quite a bit of flexibility available to manage how group members display on your public website page. Any group in your Groups module can be marked to display on your public website. Check Allow the public to view this group roster on the General tab of the group you'd like to display publicly. Then click Public page display settings to manage what it looks like. The ChamberMaster/MemberZone software allows you to connect to your Constant Contact account to automate updates to your Constant Contact lists based on updates made in the database. Once configured representatives that have been added to the database or specific groups will automatically be added to Constant Contact. Any reps that are disabled within a group will be removed from their respective lists. See Integrating Constant Contact for more details. To create invoices for a group that has been assigned a fee item with a One-Time billing cycle, Bill Group Now must be selected on the group's Fees tab. Creating invoices for a group that has been assigned a fee item with a recurring billing cycle (Annual, Semi-Annual, Quarterly, or Monthly), allows you to invoice from the Billing module by selecting the Group batch type and the appropriate Billing Month. These fees are treated as recurring fees and will be included automatically in Group billing batch. How do I add my Board of Directors to my website? This page was last modified on 21 March 2019, at 09:38.